Davis, Illinois (population 662) is located along the Stevenson-Winnebago county line in Northern Illinois. Ill. Rt. 75 goes through the town as well as a Union Pacific Railroad line. Davis was first settled in the late 1830s. It was platted in 1857 and named after the two brothers, John and Samuel Davis, who were instrumental in the early growth of the town. The origins of the school system in Davis can be traced back to 1863. It operated as a 1-12 school until 1921 when the school district was declared illegal by the Circuit Court. It then operated as a three-year high school until it was deactivated in 1949. High school students were then sent to nearby Dakota High School to the southwest. In 1965, all school functions were ceased. A very nice article regarding the history of Davis, including history of the former school system, appeared in the Journal Star Newspaper on January 19, 2014. This article is reprinted in its entirety below. We know the Davis High School boys played basketball. It is likely that baseball and track were offered as well. We are searching for further information regarding the Davis High School athletic program. School team nickname, uniform colors, and fight song. Team records and coaches' names are needed. Basketball was one of the sports offered at Davis High School. They played in the Stevenson County Conference during it's existance. In 1921, their final year as a four-year high school, Davis won the Stevenson County Conference Tournament. The Davis High School basketball team competed in the annual IHSA State Tournament. We did locate a few scores involving Davis High School on a website titled Illinois Postseason Basketball Scores" which are listed below. 1922-23 through 1932-33 Postseason scores, record, and coach's name needed. 1937-38 through 1948-49 Postseason scores, record, and coach's name needed. Back in 1839, a colony of Norwegians chose the site that would become the village of Davis as the place they wanted to live. They supposed themselves to be the first colony of Norwegians in the United States. These folk chose to settle on the Ridge Road just east of Rock Run creek. The village is located in Rock Run Township. Prominent names among the settlers were the Olsons, Andersons, Knudsons and Eversons. According to the "History of Stephenson County 1970," most of these families were farmers. Canute Canuteson ran the first blacksmith shop in the township and Ole Civertson, the first wagon shop, two of the most vital businesses to the future of any village at that time. A listing of early Davis businesses in the history includes nine doctors, nine druggists, plus shoemakers, blacksmiths, wagon makers, carpenters, hotel keepers, lumber dealers, livestock and grain dealers, clothiers, grocers, butchers, barbers, brick manufacturers, painters, harness makers, tailors, coopers and grain dealers, as well as stores for hardware, furniture and coffins. Two enterprising brothers, John A. and Samuel Davis, when they learned the Racine and Southwestern Railroad was coming through, saw opportunities. Samuel Davis, when he learned this good news, bought up more land around where the railroad planned to build a station. He hired Ludwig Stanton, a former school friend of his to plat the land. Thomas Turner, whose name was prominent in early Freeport lore, was also in on the enterprise. Edward McMahon did the surveying. By 1857, more than 157 years ago, lots in the village were being sold. The rails had reached Davis by 1858. You know what happened in 1858. Railroads were laying track right and left heading from east to west and north to south, and Stephenson County was no exception. When the Rail Splitter and the Little Giant faced off in a debate here in Freeport, folks piled into the city in droves, many coming by rail. James B. Wright was the first storekeeper and postmaster. That same year a stone school house was built with a Mr. Gleasman as teacher, states the 1970 history. Wright and Bonn opened a brickyard. In 1970, the history states, four of the first brick buildings from this yard were still in use in the village. Is there anyone who can say whether or not any of them are still in use? John A. Davis, Samuel's brother and associate, was also promoting the growth of the village, that is until the Civil War broke out. John Davis "was instrumental in raising a regiment of about 1,000 men from Stephenson County. Recruiting meetings were held throughout the county with men and boys in their teens among them. Most of the volunteers from Rock Run and Rock Grove townships became members of the 46th Regiment commanded by Colonel Davis who was well liked by all under his command. Col. Davis died before the war was over, a victim of wounds and illnesses. He was buried in Davis Cemetery after one of the largest war-time funerals in the county." Most of the owners of businesses wanted their establishments close to the depot. "Mr. Gold built a hotel in the Kramer Addition but later moved it to Stanton Street." The first home built in Davis was the house later occupied by a Becker family and later the Julius Untersees. Several houses were moved from Epplyanna to Davis, "pulled on rollers by horses and oxen." In spite of the hard times caused by the war, the village added a two-story, two-room addition to its school. The first village trustees were elected in 1871 at Claren Gold's hotel. Thomas Hays was elected temporary town clerk and Thomas Cronemiller, temporary president. On March 6, 1871, the temporary trustees met at the Bates furniture store and heard J.B. Smith take the oath of office for the presidency of the Village Board. In 1872, W.A. and N.L. Colby of Pecatonica started the "Davis Weekly Gazette." The paper changed hands several times until the middle 1880s when there was no paper in Davis. The "Davis Sentinal" served the village for a time but no records were found as to its duration. A steam-powered flour mill had been constructed in 1876 by the Davis Manufacturing Co., but "the black-rust disease" had cut down the growing of wheat so the mill was closed in 1880 and the building eventually destroyed. The history states that in 1880 the town now had 12 stores of dealers in dry goods, groceries, drugs and other commodities; two blacksmith shops "in one of which a superior quality of plow is made"; three churches, one newspaper, one mill and "other evidences of prosperity." Kerosene street lights were installed during the 1880s and a creamery was started in 1882 by the Kunz brothers. 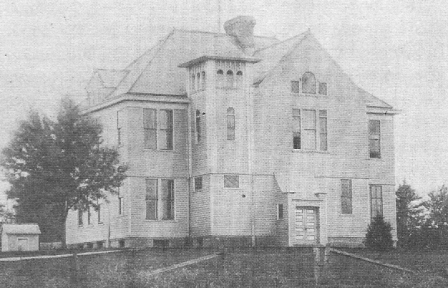 Additional land was purchased in the west side of the school ground and when the present school was built in the spring of 1897 it was located in the center of the school property about 100 feet to the west of the old building. The Farmers Bank of Davis was organized in 1895 and occupied a new brick building on Stanton Street. Thurston Stabeck and T. Briggs were founders. Clement Stabeck was cashier for many years. The bank closed briefly for reorganization in 1928 and again in 1931. Telephones were brought to Davis in 1904 by the Peoples Mutual Telephone Co. and purchased in 1955 by the Northern Illinois Telephone Co. Electric lights came next when the Davis Electric Light Co. went into business in 1915, replacing the kerosene street lights. That company was organized by Jacob Best. In 1921, an addition was built to the Davis schoolhouse to be used by the just-formed four-year community high school district. Like others in the county, the history states, the district was declared illegal by the Circuit Court. The village then operated a three-year high school until 1949 when it became part of Dakota Unit District No. 201. The Davis school was used for the grades until 1965 when the new Dakota grade school building was completed and the Davis building was sold and razed. During the one year Davis had a four-year high school, there were only nine boys in the school. Eight of these boys played basketball and won the conference tournament. A volunteer fire department was organized and a truck purchased in 1927. The village was rejuvenated in 1929 and 1930 when Illinois State Highway 75 was constructed. Since then village streets have been paved and county roads improved. The history goes on to tell of the evolving of churches, organizations and social and recreational institutions, and it gives listings of the businesses there in 1970 when the county history was published. Somewhat surprising is the type of stores supported at that time. Included were a confectionery store, an arts and crafts store, a floral shop and miscellaneous trade services, taverns and the bank. We can't help wondering how many of those old Norwegian names still prevail in Davis. Whatever, the village remains a picturesque place to live where its people remain by choice.